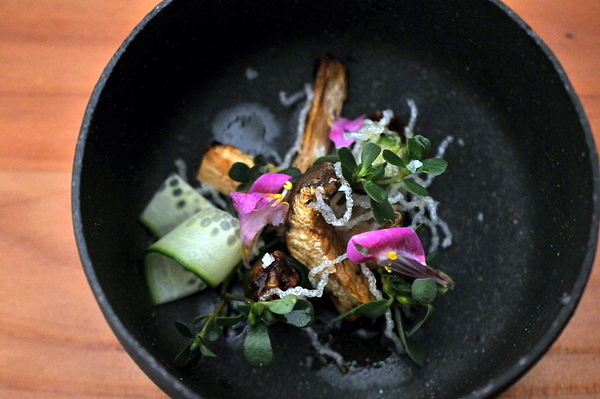 I wouldn't have expected to find a modern Kaiseki restaurant in Austin much less one that requires diners to buy tickets in advance, but a quick look at Austin's dining scene shows a surprising plethora of Japanese restaurants. 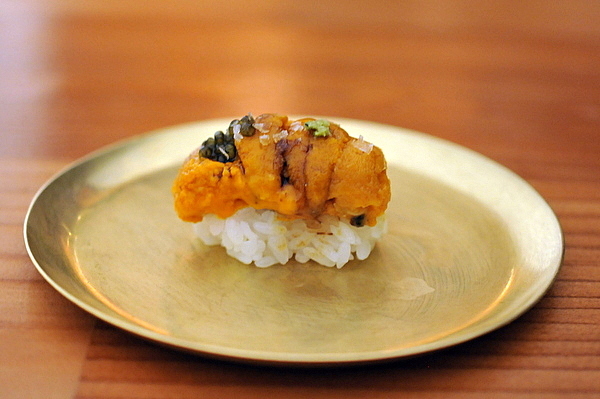 This is largely thanks to the outsize influence Uchi has had on the city since it opened in 2003. 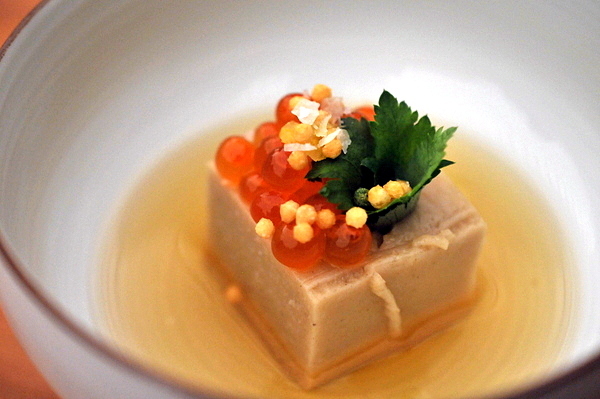 Uchi gained national renown for its marriage of traditional Japanese technique with contemporary multi-cultural flare. 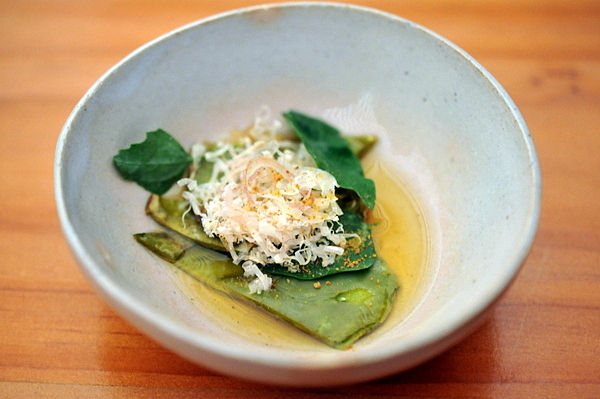 As a result of this reputation, many of Austin's young up and coming chefs have done a stint at either Uchi or its sibling Uchiko. This includes Paul Qui, arguably the most famous Uchi/Uchiko alum and Top Chef Season 9 winner to boot. While Otoko might trade on Paul Qui's name, in reality his former senpai (senior) Yoshi Okai is the one who runs the show. Okai, a Kyoto native grew up helping out at his family's catering business and after a brief stop in California to study landscape architecture, wound up at Uchi where he started to learn about sushi. The heavily inked Okai looks more like a dokyun rock-star than a sushi chef(Okai is actually the lead singer in a punk band called the Kodiaks), but his easy smile and high-energy bring a comfortable casualness to the intimate dining space where he works his magic. 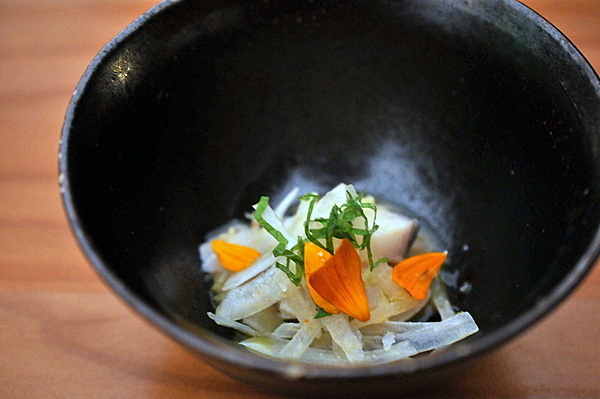 The meal opened with a salad of chayote and fennel on a bed of jellyfish that was a study in crunchiness. On the palate the dish was a bit jarring, mixing licorice with the funky earth of the mushrooms and a bright citrus pop from the lime in a combination that never quite jelled. The second appetizer was a much heavier salad of Nopales in a multifaceted fish sauce that was salty and pungent with a whiff of BBQ-esque smoke on the finish. Though I've never been particularly fond of Nopales, I appreciated the Southwestern flair they brought to the dish. 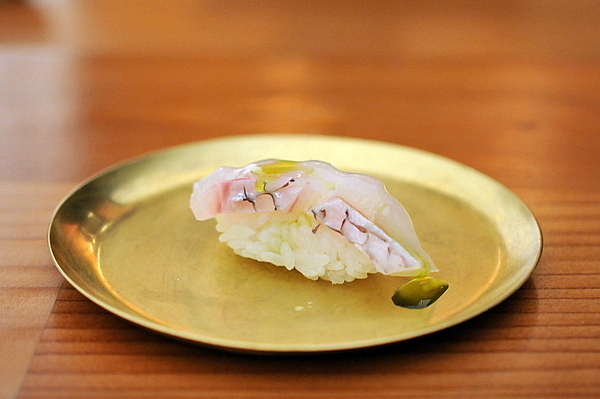 Unlike traditional Kaiseki, the meal immediately veers from appetizers to nigiri. Our first piece of sushi was a sliver of firmly textured sea bass. 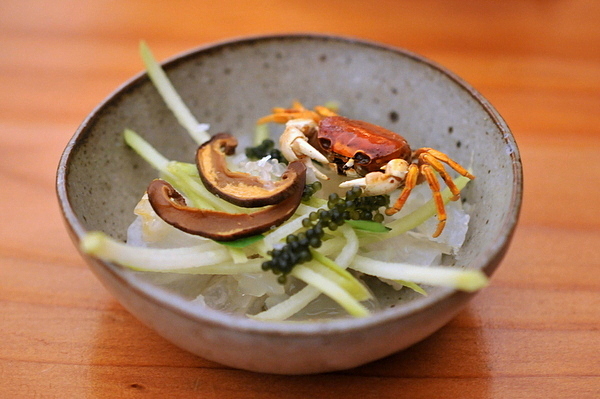 The fish was seasoned with, an old-school "soy" sauce of rice wine, shaved bonito flakes, and pickled plums popular during the Edo period that added a gentle persistent fishiness to the traditionally mild bass. Next up was a stellar example of Amberjack. The mild oily flavor is tinged with a sweet butteriness that played beautifully with the citrus-y zip of the fresh zest. Shigokus have always been one of my favorite oysters on account of their creamy body and delicate melon-y character. 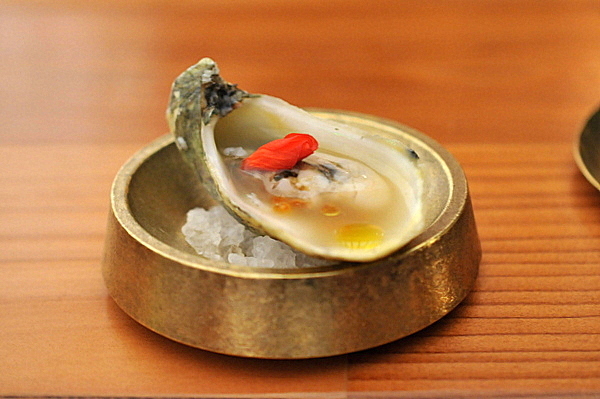 Unfortunately the flavor of the oyster was overpowered by the one-two punch of salt from the ponzu and smoked roe. I am more used to seeing a light sear on Wagyu but Chef Okai spent a long time lovingly torching each slice over a bed of binchotan. The extra time worked wonders with the skirt steak by highlighting the cut's intrinsic beefiness while imparting a wonderful smokiness. After a quartet of inventive nigiri, Chef Okai opted for a classic but effective pairing of salt and yuzu on the halibut. 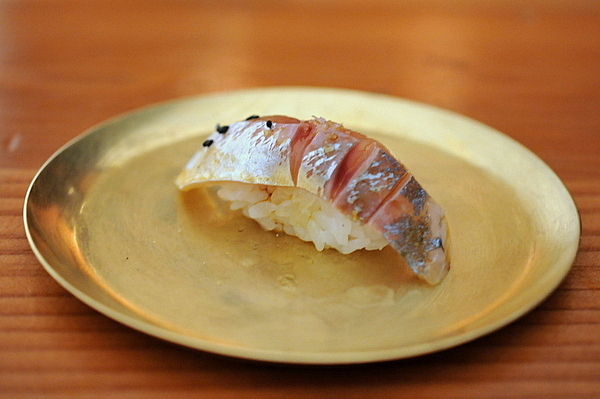 Chef Okai served up a supple of minimally dressed Aji with just a dash of salt and black sesame. The result was a pointed clean oiliness finshed with a hint of nuttiness. 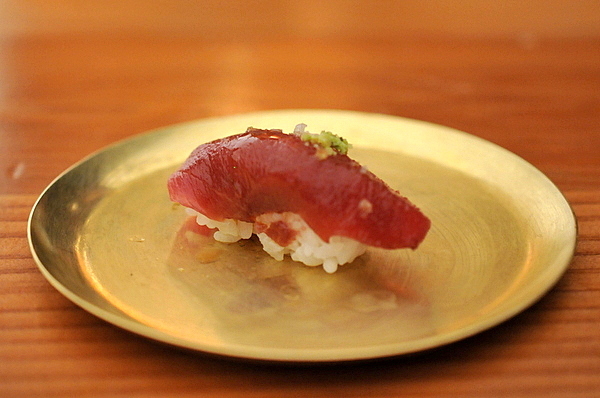 Okai has somehow procured Kindai tuna, a more sustainably sourced form of the prized Bluefin. Okai smartly sticks with the classics here and the familiar flavor of wasabi and soy are somehow elevated when paired with the slightly rich twang of the Bluefin. 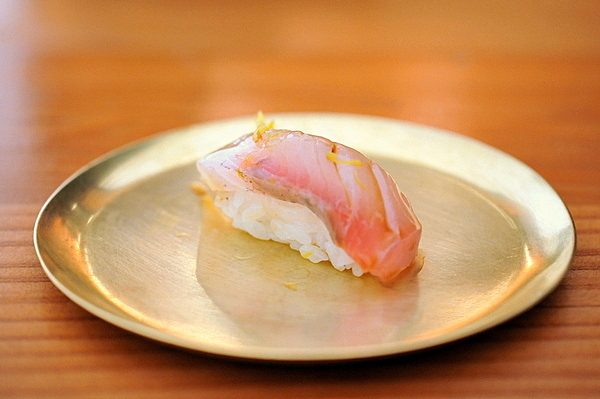 Add to that the smooth even mouthfeel of the fish and you have the makings of a top notch Akami. The lush creamy roe oozed rich salinity with a creeping sweetness and while the caviar fit nicely, the salt was just a hair too strong. 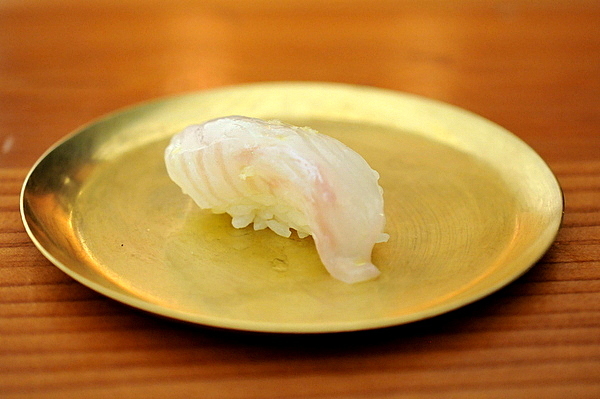 The final nigiri of the night was an alabaster cut of madai drizzled with a verdant matcha-infused oil. 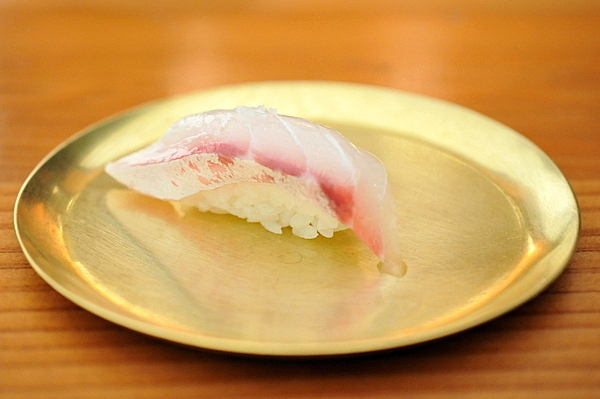 The delicate flavor of the snapper was a good base for the subtle nuttiness of the oil and floral notes of the cherry blossom. Moving on from the nigiri, we were presented with a summery composed sashimi presentation. 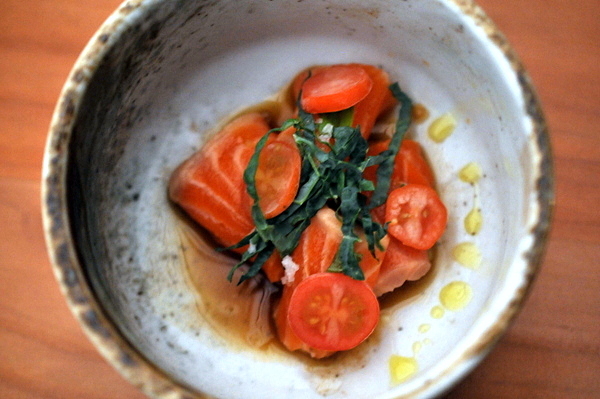 The tangy ponzu and high fat content of the trout worked together nicely with the fresh basil and icy rush of the tomatoes. The ever popular miso Black Cod has always been a bit heavy handed in my opinion but I quite enjoyed Okai-san's more complex presentation. He deftly tempers the buttery sweetness with a soft herbal fragrance and hint of earthy savor. This course veered from flavor to flavor in rapid-fire fashion, sweet and nutty one minute, then bright acid the next. Sadly the only flavor that was missing was the mushroom though they did provide a pleasing slick squid-like texture. Fittingly the headline of this course is the charcoal and indeed it is all about the Binchotan. 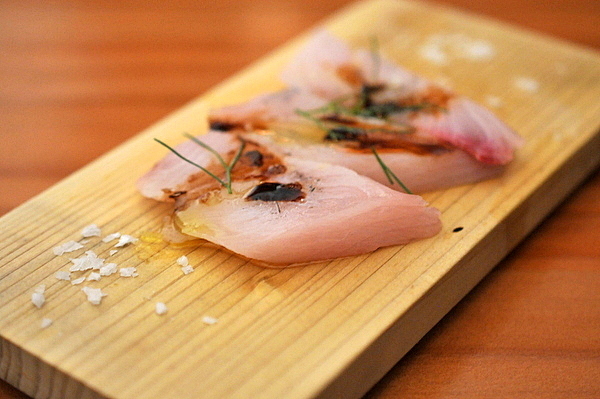 Chef Okai plates and dresses the thick slabs of yellowtail, pulls out a piece of red hot charcoal from the grill, and taps each piece of fish sending up wisps of smoke that fill the room with a woody smoke tinged with umami from the fish oils. Technically the fish itself is enjoyable, but largely a blunt sledgehammer of smoke though the fennel and olive oil help matters somewhat. I've been warming to sesame tofu of late. The neutral nutty block is a perfect vehicle for whatever flavors the chef sees fit to pair, in this case the truffle oil and yuzu. The bubu arare really pops here like a savory cereal dippin dots. 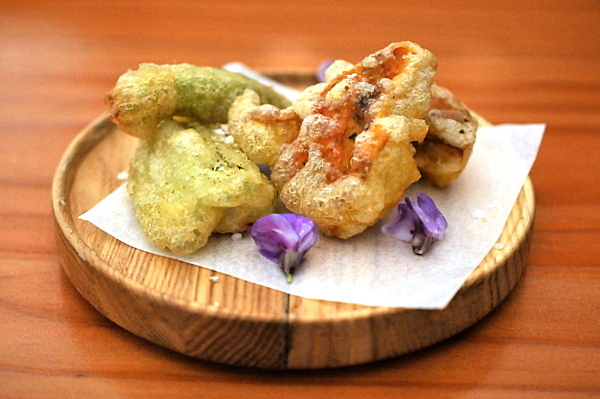 Next we were presented with two types of vegetable tempura, the first was a Japanese-influenced take on fried okra. The Italian Ovoli mushroom was definitely the more memorable of the duo, with a deep earthiness tinged with sweet yeastiness of the freshly fried batter. The cool cucumber gazpacho was a nice follow-up to the hefty tempura. 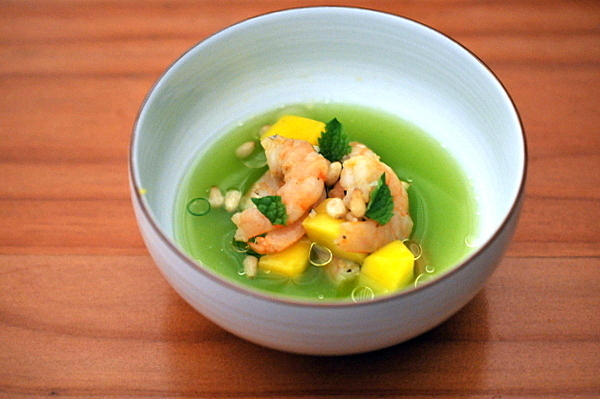 The verdant broth is unabashedly tangy with layers of heat and sweetness to keep the dish from being too astringent. The shrimp was a touch overdone and in my opinion superfluous to the cohesiveness of the dish. 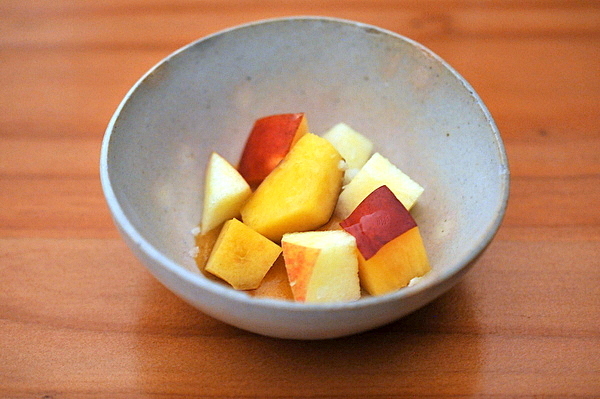 The simple fruit intermezzo was especially effective with the sweetness of the fruit standing in sharp relief to the acidity of the Gazpacho. The final dessert was as much a feast for the eyes as for the palate. 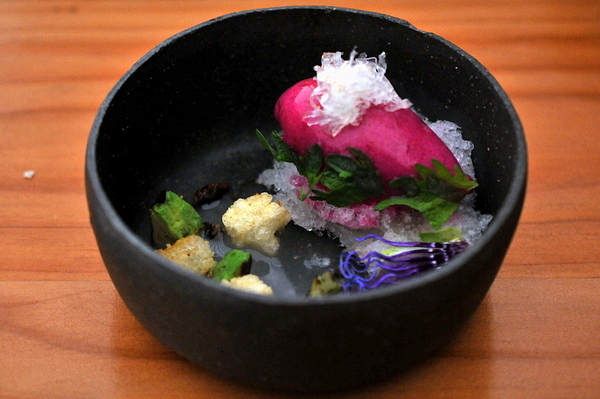 The prickly pear ice cream rests atop a bed of frozen sushi rice milk with the latter providing a creamy even temper to the unabashed florid flavor of the cacti. The bits of avocado and mochi tempura bring a hint of savor and substance that round out the frozen elements in the bowl. 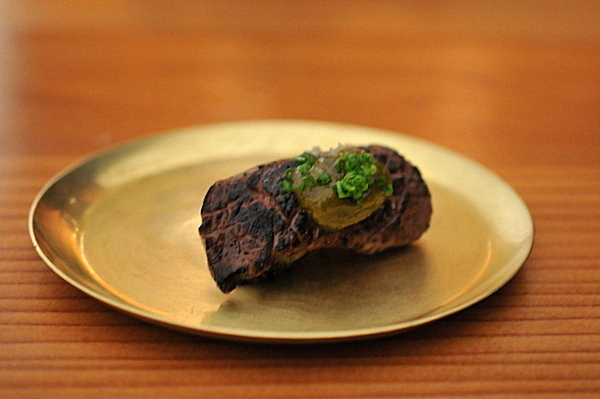 From the moment that you step into the dining room at Otoko you are in for a treat well worth the $150 ticket price. While not all the dishes worked for me, I certainly appreciated the irreverent creativity that went into them. It is that combination of ambition and high-octane punk-rock flair that landed Okai a spot on Food & Wine's list of best new chefs for 2017.